This month, Around the World in 12 Dishes is visiting Brazil. When I asked Lizzie what she learned about Brazil, the first thing she said was, “they make good chocolates!” Why yes, they do. The food we chose for Brazil was the brigadeiro, a popular chocolate candy. They were fun to make and definitely yummy. The recipe was simple and had only three ingredients. But, like all candy recipes, there are some tricks for success. Make sure you cook the ingredients over the stove until it is thick and comes away from the bottom of the pan. 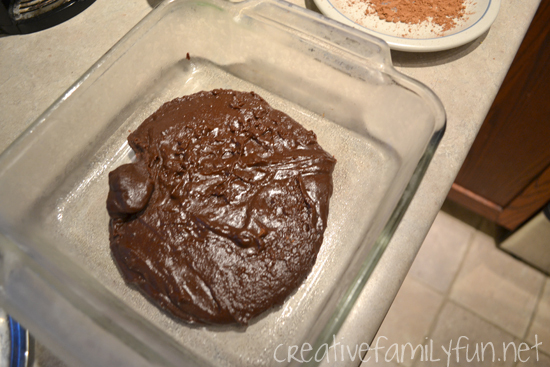 You can see in the above picture that when I poured the chocolate mixture into a pan to cool, it stayed in a big blob. I also popped my pan into the freezer for a quicker cool down. If you try to make the balls while the mixture is too warm, you end up with a sticky mess. Traditional brigadeiros are covered in chocolate sprinkles, which I didn’t have in my cupboard. Instead we rolled out candies in cocoa. The girls took over the candy making. 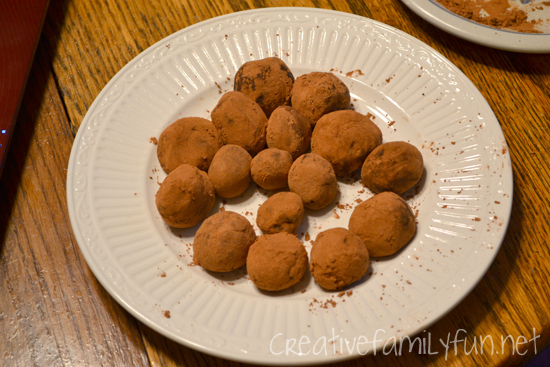 They made the balls and rolled them in the cocoa. While they were making the candy, we watched a few on-line videos to learn about Brazil. National Geographic Kids is a fantastic resource for kid-friendly information about the different countries of the world. We viewed the photos and the map and also watched the short video on the site. We had started our journey the same way Phileas Fogg did in London, UK, and now are arriving in Brasilia, capital of the biggest South American country Brazil.! November 4 – The ninth country is Brazil! Cook a dish from Brazil: The goal is to explore this country through FOOD and activities if you wish. Make a typical dish (sweet or savoury) from the country with the kids, take photos and have fun! Typical dishes: Feijoada, Baião de dois, Sarapatel, Galinhadaplus Queijadinha, Moqueca de peixe and Bridgardeiros. Fun fact: Brazil has one of the New 7 Wonders of the World, the Christ Redeemer statue, located in Rio De Janeiro. Yay!! Hi from Brasil! 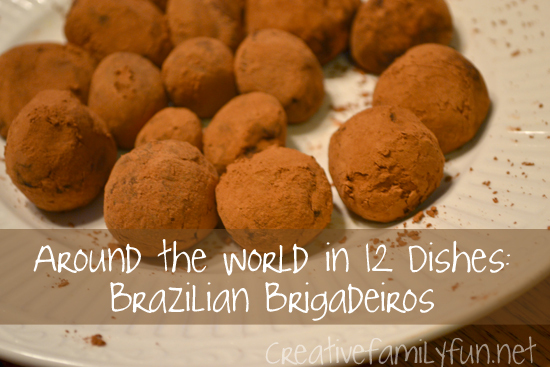 I have lived abroad and tasted yummy stuff, but none have beat our brigadeiros. All our birthday parties must have it and we learn to make it in kindergarten. Hope you all enjoy it! Audrey Scarante, from Curitiba, Brasil (with an 's', as we spell it). 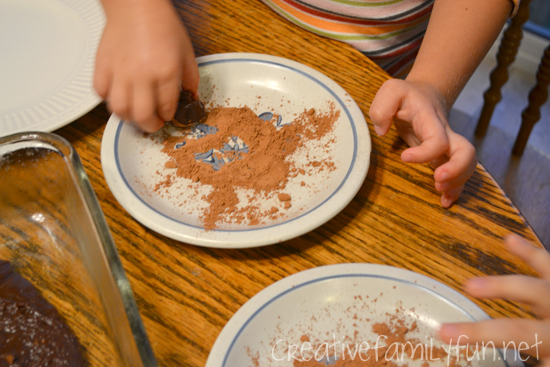 Homemade candy has to be THE best food for kids to make! :) How fun- and sweet!